This rabbit looks like such a happy fella. I think he’s just as joyful as can be because he’s the star of the show in this letter identification worksheet for the letter r. Maybe he just likes to smile for the camera. It’s a good picture, maybe that’s why it got framed in this alphabet letter frame. 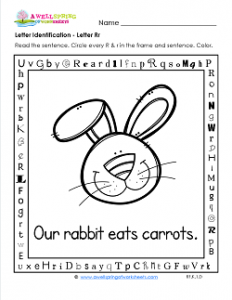 Your kids can practice their letter recognition skills by looking for all the letters in the frame and the sentence, “Our rabbit eats carrots.” There’s 16 r’s in all. Don’t forget to look for the hidden sight word, too. Along the bottom part of the frame the word “say” was purposefully inserted, but after taking a second look, I see the words “by” and “so” and well as “car” or “card” along the top. Coloring is part of the fun so don’t leave that out!